I’m Zoey, and my person Lauren Vancouver said it was all right for me to blog here again. I've done so a couple of times so this is nothing new. But even though I woofed before about Lauren's adventure that is described in a new book coming out next month, I wanted to say more about what I think of it. That book is called TEACUP TURBULENCE, and like I said the last time there are a lot of little dogs in it, ones much smaller than me. I still don't completely understand the breed thing that humans talk about, or why it sometimes matters that we dogs can have more than one of those breeds in us, but Lauren always says I'm part Border collie and part Australian shepherd. That means I'm middle sized, as far as dogs go. The dogs talked about most in TEACUP TURBULENCE are little puppy-sized guys like Chihuahuas and Yorkshire terriers. I like little dogs well enough, but it was kind of a strange thing to have so many of them at the shelter that Lauren and I run, HotRescues, and then go away again fast. We always have a few, and they're mostly kept in kennels in one of the buildings. But for a while we had hardly any at all around. From what Lauren said, that was because of Dante DeFrancisco. He's the nice human who she says provides food and more to HotRescues. He's supposed to have a lot of money, although I'm not exactly sure what money is except that if people have it, they can feed us and make sure we have someplace to stay. Anyway, Dante owns HotPets, which is a bunch of great stores. I've visited some and they've got good food and toys as well as other things that people seem to think we dogs need, like leashes and collars. He gets money from the stores. And Dante also started putting moving pictures up on streets on things called electronic billboards. And also on television. Now, I've seen both of those things. I sometimes like to watch their pictures, but their smells are strange and don't really go along with what those pictures are. Some of those pictures had those little dogs on them wearing collars with sparkly things called jewels on them. People must have liked those pictures because suddenly there weren't any little dogs around HotRescues even though there were humans wanting to take some home. So my wonderful human Lauren figured out a way to save more of those tiny dogs--some that were from someplace else in the United States where there were too many of them that no human wanted to adopt. She had people fly them to our city, which is Los Angeles. Fly. In a thing called an airplane. Like I mentioned the last time, I know what an airplane is since I see them sometimes when I'm on walks or even at HotRescues, moving and making noise in the sky. And, yes, I even bark at them now and then. Supposedly thanks to those airplanes, and the humans who get in them and make them fly in the sky, there were suddenly more of those little dogs at HotRescues. More humans, too, wanting to adopt them and give them new homes. I liked that part. A lot. I can understand it, since I once had no home or food or anything else, and then Lauren became my person and I now have a wonderful life. I don't mind if other dogs, even small ones, can also get a new person to take care of in exchange for food--and love. Yes, dogs know what love is. I sure do. I share it with Lauren every day. But not all people love other people. In fact, like I said before, one person in TEACUP TURBULENCE is killed by another human, and Lauren has to figure out who the bad person was. And of course she does, although it's not easy for her. My Lauren is a very special human. I help her, of course, sometimes just by being with her. But the way she does it... well, she has told me not to give away the story. She wants you to read it. So, I want you to read it, too. We both think you'll like it. Oh, and by the way, Lauren told me to tell you that someone who comments on my blog will win a copy of the last Pet Rescue Mystery, OODLES OF POODLES. She'll write all the names down and I'll step on the winner's name with my paw. She also said that everyone who comments should leave an email address. 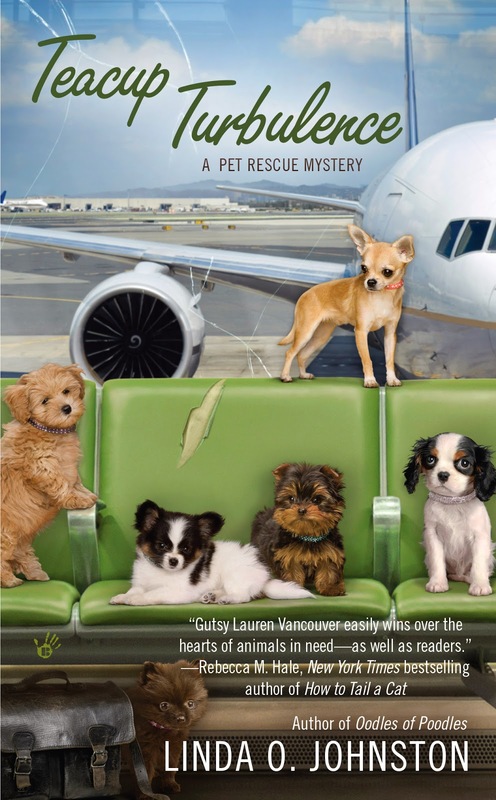 TEACUP TURBULENCE, the fifth Pet Rescue Mystery by Linda O. Johnston, is a January 2014 release--coming soon! What cute little dogs....of course ALL DOGS no matter their size are cute! Thanks for info and so far have enjoyed all your books! like little dogs well enough, but it was kind of a strange thing to have so many of them at the shelter that Lauren and I run, HotRescues, and then go away again fast. I've read the first 2 books in the series and enjoyed them. Thanks for the opportunity to win the latest one. Oh my gosh! What adorable little furry babies. I love dogs and have had several poodles over the many years. Would so love to be your winner. This sounds so good. I would like the opportunity to read. I'm more of a edium sized dog person. Thanks for sharing Zoey. I hope lots more animals find their furever homes-whatever their size or species! I love this series! (Loved the Pet Sitter series, too) My first dog was an Old English Sheepdog. Now I'm a Shih Tzu person...... their hearts are the same size! OOPS! My email address is lovesdogsandbooks (at) yahoo (dot) com I left out a letter in my first post! Please step on me with your paw. 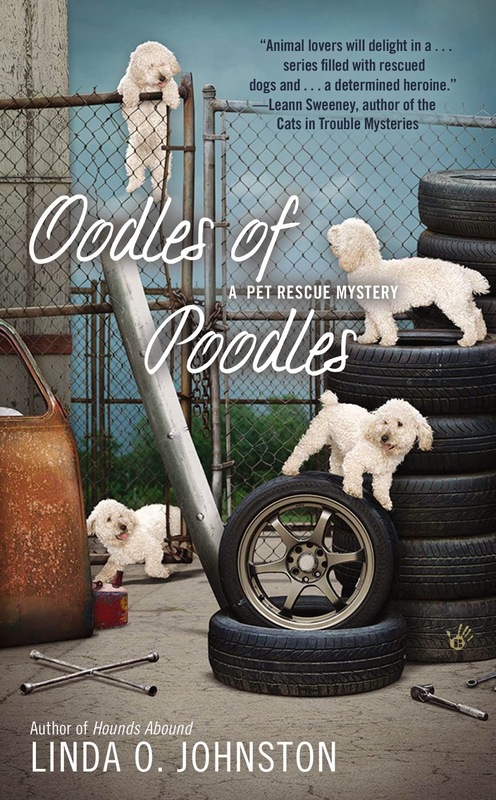 I love pets and pet mysteries and this series is just perfect reading. I'm really happy to see so many humans who love dogs commenting here. Lauren tells me to say thank you. Hmm. No way to put a treat scent on my comment. No cheating allowed. I would like to try this one, thanks for the chance to win. Excellent job, Zoey You have definitely earned a treat or two. Thank you for chatting with us today. I love this series...Thanks for the giveaway! Oh, please, step on my name! I want to read about you and all the little dogs. what a good doggy blogger! i love the hotrescue mysteries, glad to know there are more, i liked the idea of the chihuahua airlift, good idea for a mystery!